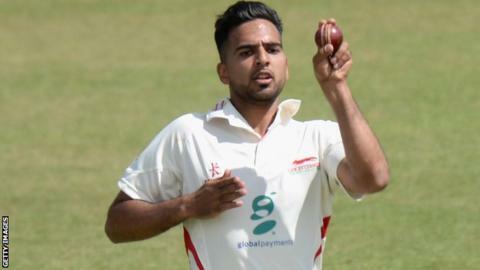 Leicestershire prospects Atif Sheikh, Lewis Hill and Aadil Ali have agreed contract extensions at Grace Road. Paceman Sheikh, 24, has added another year to his current two-year deal after signing from Derbyshire last July. Second XI wicketkeeper/batsman Hill, also 24, has penned a one-year extension until the end of 2016. Promising batsman Ali, 20, has agreed a two-year extension and, like Sheikh, will remain with the Foxes until at least the end of the 2017 season. Last September, Sheikh became the first Leicestershire bowler to take a Championship hat-trick since Matthew Hoggard in 2011, while Ali and Hill were part of the second XI's treble-winning side in 2014. Leicestershire and Rutland Cricket chief executive Wasim Khan said: "We are looking to build something that is sustainable in the long-term at Grace Road and it's good that these three players have committed their futures to us."